The bioWAVE device integrates three vertically-oriented paddles, which sway back and forth beneath the swell waves. Image: courtesy of BioPower Systems. BioPower Systems’ proprietary O-Drive power conversion module was grid-tested in August 2011. Image: courtesy of BioPower Systems. The offshore installation works were completed in December 2015, deploying a crane-equipped ship. Image: courtesy of BioPower Systems. The patented O-Drive integrates a hydraulic circuit, a motor and an electric generator. Image: courtesy of BioPower Systems. The final engineering and design works for the project were completed in September 2014, onshore construction and testing works were completed in June 2015 and the offshore installation works were completed in December 2015. The pilot project is expected to operate for a period of 12 months, following which the facilities would be decommissioned and the data collected from the project would be used to design a larger 1MW commercial-scale bioWAVE unit. The project was developed with an estimated investment of $21m, which was backed by an $11m funding from the Australian Government through the Australian Renewable Energy Agency (ARENA), a $5m funding from the Victorian Government under the Sustainable Energy Pilot Demonstration Program and $5m equity from BPS. The bioWAVE device is a 26m-tall steel structure incorporating three vertically-oriented paddles, an onboard O-Drive, which is a BPS proprietary power conversion module, a support tree structure connecting the paddles to the O-Drive, a base of the support tree, and main foundations. The paddles sway back-and-forth beneath the surface of the ocean, aligning with the forces of the waves. The resulting wave energy is used to move the O-Drive’s hydraulic pistons, which pressurises the hydraulic fluid to feed a hydraulic motor. The motor further drives a generator to produce electricity. Power is conveyed via a 3.3kV subsea cable to the onshore site, before being transferred to the national grid. The design of the bioWAVE device is inspired by undersea plants, which enables it to lie flat on the sea floor during extreme wave conditions. The O-Drive module is a fully-automated device integrating in-built processors. Its on-board control systems can be accessed through a fibre-optic communications line piggy-backed to the subsea power cable. It is also designed to be easily detached and retrieved for onshore servicing. "The design of the bioWAVE device is inspired by undersea plants, which enables it to lie flat on the sea floor during extreme wave conditions." The project’s onshore facilities include a 415V / 3.3kV transformer, switchgear, protection equipment, a power use meter, and ancillary wiring, located on a grid-connected site, 4km west of Port Fairy. The bioWAVE unit for the project was assembled at Strategic Marine’s shipyard in Vietnam, final assembly works were performed at a site near the Port of Fairy and the facility was transported and lowered at the site deploying the crane-equipped HHL Fermantle ship. 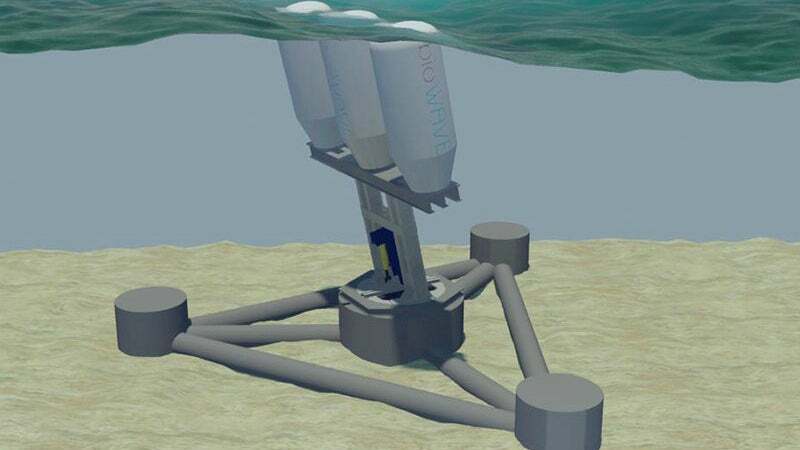 The Australian wave energy project also involved the deployment of two cardinal buoys to identify the location of the project site offshore. The pre-development works at the onshore site were performed by Diamond Energy. The final engineering and design works for the project were performed by WorleyParsons, whereas the engineering designs and installation methods were reviewed by DNV GL. Transformers Manufacturing Company (TMC) supplied the transformers, whereas the power use meter was supplied by Advanced Controls. Elical performed the detailed design of the shore-based electrical works, whereas the installation works were performed by R&M Menzel Electrical. The subsea cabling works were performed by Professional Diver Services. The 8m-long pressure vessel encasing the O-Drive mechanical-electrical equipment was supplied by L&A Pressure Welding, whereas the auxiliary hydraulic systems were supplied by Hydac. James Walker has the skills and in-house expertise to problem-solve, design, develop, test and manufacture specific products and systems for customers. Acoustical Solutions offers a complete line of soundproofing and custom noise control solutions engineered for the power and energy industries.